This article by Ed Stannard appeared in The New Haven Register. Grill up the jerk chicken. Start rocking to the reggae beat. Jamaicans are now the largest group of immigrants in Connecticut. While that may appear surprising, given the growing presence of Latinos, the count of 2010 data by the Pew Research Center’s Fact Tank counts countries of birth, not ethnicity. And Jamaicans outrank any other country. “Most of us moved here since the ’80s. 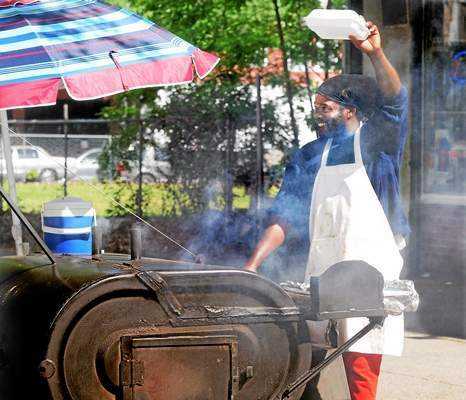 … Connecticut is more a family place,” said Gregory Martin, 35, who has owned the Caribbean Connection take-out for nine years. “You can raise your family here. Martin was grilling jerk chicken on an enormous coal-fired grill, with smoke pouring into the street outside his store at 370 Whalley Ave.
As to why he didn’t move to a warmer state, Martin said “more disasters happen” down South. A friend, Nicholas McDonald, 38, who was visiting with his 12-week-old daughter Isaballa, has been in New Haven since 1993. McDonald said he’s been working in food service at Southern Connecticut State University for 20 years. A relative, Garfield Pilliner, was named New Haven’s teacher of the year. For recreation, he runs track and plays field hockey in New York. It’s not that there are a lot of Jamaicans in Connecticut compared with other groups; it’s just that Connecticut has a really diverse immigrant population. In fact, Jamaicans hold the edge with 36,000, “next was about 30,000 Indians, then Poland with about 28,500; Mexico was actually fourth with about 24,700,” said Jens Krogstad of the Pew Center. “The reason Jamaicans are No. 1 in Connecticut is in part because there are very few immigrants in Connecticut to begin with,” Krogstad said. But Connecticut happens to have a really diverse immigrant population, though there are not that many of any one group, Krogstad said. While Jamaicans comprise the largest contingent, immigrants are only 8 percent of the population, whereas California is composed of about 27 percent migrants. Most of the Jamaicans in New Haven came to join family, almost all those interviewed said. Jamaicans may not hold on to their No. 1 ranking for long. The largest group “could definitely change in a relatively short period of time,” Krogstad said. In 2000, for example, Poles and Mexicans were the largest groups. New Haven isn’t the center of Jamaican culture in Connecticut. Krogstad said there are 5,347 in the New Haven-Milford metro area, 10,355 from Bridgeport down to Norwalk and 17,874 in Greater Hartford. Not surprising but if they had done their research they would know Jamaicans are in Connecticut from far back as the late fifties.SW St. Ann should be a significant contributor to the demographics of cities like New London, Stamford, Bridgeport and Hartford. Nearly one in six relatives in Aboukir, St. Ann has relatives in Connecticut. Personally it is my second favourite state next to Mass, as it reminds me of the rolling upland topography and plateau country of St. Ann. Back in the old days nearly every bed linen, bath towel or oxford male shoes and “timberland” types boots were manufactured in Connectinut. These days I see no Canon towels but stuff made in Pakistan and China.